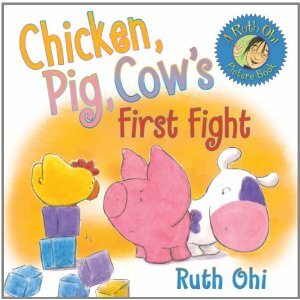 We've read Chicken, Pig, Cow, the first in the series, and this is a particular favourite for my kids, especially my daughter. So the newest book in the series was highly anticipated and not only by me. Chicken, Pig, Cow's First Fight did not disappoint. Despite not having read the other books in the series between the first and this one, we are able to jump right into the story. Chicken, Pig, Cow, and Dog still exhibit the same distinct personalities as in the first book. Chicken, Pig, and Cow are playing amongst a block city when one rambunctious member of the trio bowls down Chicken's masterpiece. Just like my own children, doing something wrong puts Pig on the defensive, and he gets as grumpy as Chicken. They play the blame game before Pig puts himself in timeout. When he returns he makes up with Chicken, and they all, even Dog, put things to rights. I like how realistic the fight was- certainly this occurs more often in my house than someone apologizing right away. Pig also shows that it is okay to remove yourself from a situation if emotions are running high, instead of standing and squabbling forever. My kids all had their own ideas for how Chicken and Pig should settle their argument, here's hoping they use these themselves soon! I love the block Chicken they all made at the end. Ohi is a master of textures and of showing deep feeling on faces drawn with only a few brush strokes. That's what will keep her books on our "must-buy" list. This is the 27th book I read for the 5th Canadian Book Challenge. Thanks for the review. I've seen Ohi's books before but haven't felt compelled to pick them up, until now. I also like the look of her cute characters.